- The apostle, an attack. A mysterious living body that appeared suddenly after a long silence, apostle. The weapons of the UN forces that gathered to counter it did not have any teeth at all ... Finally the command of battle against the apostles was transferred to the special institution Nerf. 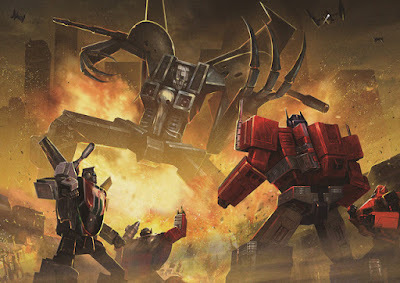 The Apostle who invades silently aiming for the 3rd New Tokyo City ... At that time, the Space Shuttle descends from the sky far, Cybertron 's Skylinks. What appeared from inside is the Saibaton warriors led by the convoy who has perceived indispensable energy reactions from the head of Haruka Seiberton. "I can not let the planet cause tragedy like that second impact ... on this planet ... What is that monster !?" The convoy that fell on the ground is far more enormous than ourselves ... amazed at the apostles. "That is ... what on earth? It does not seem to belong to the UN army." Nerf Operation Directive, Mitsato Katsuragi is at a loss as to how to respond to unexpected situations. At that time, a mysterious shadow appears before the apostle. "I feel it ... this energy ... this guy is suitable for my new body ...!" "What is that ... is that ... Star Scream !?" A convoy that raises voices unexpectedly. Yes, it was a starcream that lost its life in the UNICRON war several years ago, sparks body ... it became a ghost and it kept wandering. The shadow of the ghost starscream integrates with the apostle and its appearance changes and it changes. It was like a half-life, but it was exactly a huge Star Scream, also called "Apostle" Scream. "... ... what ... what's that ... the apostles ... deformed !?" Truly Misato can not hide surprises in this situation. "Huh ha ha! Finally I got a new body!" "Apostle" Scream raises laughter. I notice the convoy who are at feet. "Hehehe ... with Cybertron, are not you? Just right, let me try my new power!" "Apostle" Scream that aims at the convoy. The difference in size was hopeless and Cybertron warriors were out of touch at all. The situation is getting confused in unexpected situations that occur one after another. However, the commander Misato ordered the injection of Eva's first machine as planned. Mirumiru 3rd New Tokyo City will change. "Mumu? Will this city transform like a scramble city?" The convoy thought so, the ground in front of him opened, the first Eva aircraft lifted up and appeared. Cyberlon fighters who are unlikely to be overwhelmed by their sense of scale. "What a man ... that human beings could build such a huge robot ...!" However, the convoy who saw that figure falls into a strange feeling. (This ... is not a robot? I feel the beat of life ... No, it is a primitive call? As guided, the convoy scans Eva's first machine, and surprisingly the body gets bigger and the body color changes to the same purple as the first machine. "... now ... Transformers ... Eva ... !?" Misato and Neruf officials are stunned by the situation in front of me. A gigantic convoy gazes at the "apostle" Scream, opens the chest armor and raises the roar. The chest matrix sounded like a core of the apostles, red as it sounded like a breath of new life. "What did you ... ... convoy! You got a new body!" A star scream got a huge body integrated with the apostle ... the apostle Scream raises a voice. Before that is Convoy Mode Eva, General Commander of Cybertron, who has scanned Evangelion 's first machine and became a purple giant sized far beyond the usual Transformers. A convoy that closes the chest armor and quietly scatters the apostle's scream. Cybatron warriors who climbed to the surrounding building group call out a reluctant voice. "Commander! Is ... Are you OK?" "Oh ... I am fine, it's a mysterious feeling ..."
A huge convoy responds to Lanbol who seems uneasy. Although the consciousness is clear, the convoy has no feelings before ... In other words, I felt like I had another new life in my life. "Do not think that you can win with just the same size as myself, convoy!" The face of the apostle floating on the chest of the apostle scream, when you think that its eyes shine, a number of light bullets are fired for the convoy. When seeing the first Evangelion machine behind it only for a moment, the convoy picks up light bullets in his own body as if to cover it. "Please do not like yourself! Star Scream!" Convoy takes out a favorite laser rifle which has become enormous in size as myself, and attempts counterattack to the apostle scream. But that shoot did not reach the body of the apostle Scream. "What ... is it not working?" A barrier-like thing was deployed in front of the apostle scream, and it prevented all shooting. "A.T. Field ...! Again the huge transformer is absorbing the power of the apostles ...!" Misato who was looking at the war situation at the headquarters murms. Nerf headquarters was making noise in a completely unexpected situation. "He Hehe ... This guy is a good ability, if you have this power you will not lose to Galvatron's guy anymore." If you say so, the apostle Scream will head to the convoy. The convoy whose reaction was delayed quickly was grabbed by a sharp claw of the apostle Scream and his head was suspended suspended. "First of all, we will deal with you from a convoy, who plays a hatred of you for many years, I will defeat you, Commander of Cybatron and make the birth of Destron New Leader my whole world in the universe!" Then the pile of light stretches from the enormous Narbeam Cannon about the arm of the apostle Scream, and is struck to the head of the convoy as it is. It can also be called a null beam pile It stretches and shrinks over and over and gradually accumulated damage on the armored armor of the convoy. While holding the arm of the apostle scream, the convoy raises a voice of agony. Although the surrounding Saibatron warriors managed to cover the commander, they were overwhelmed by the difference in size with the two giants and attacked. At that time, the wheel jack senses the communication radio waves and adjusts the line. "Here is the Kasatsuki Misato of NARU Operations Headquarters in the Special Affairs Bureau, can you hear me?" Even though he hesitates for a moment to the name of the organization he can not hear, the wheel jack responds. "We are the Cybatron Corps' foiljack, what is the organization like that !?" It is the first dialogue with a transformer who is an alien, but Misato is somewhat surprised at somewhat disgusted tone that it hears from the correspondent, but also rethinks and tells the matter. "Since the Eva prepared here does not move, the annihilation of the apostles can only bet on that huge transformer. Listen carefully from now on!" "Fuhufu ... The wind hole will open in my head soon, convoy, how much you have already finished." The persistent pile attack of the apostle Scream runs cracks on the head of the convoy. However, at that time, a shootout was released to the apostle Scream. "... What is it, Kuzu?" It was an attack by Cybatron warriors, but there was no effect on the Apostolic Scream with the size difference as well as the A.T. field. "Star Scream! If you grow so big you will not be able to demonstrate your boasting speed anymore! You can not even catch the Oila!" Run around the feet of the apostle scream so that Bumble provokes in the vehicle mode. "Wh ... What are you saying? Do not lick me like this!" Acts Scream will try to crush the bumples while grasping the convoy. However, you still can not catch up with the unbalanced body of the new body, you can not catch up, it is pulled back. Then suddenly the road at the foot of the apostle scream suddenly deformed and turned up with the command of Misato. The Saibatron warriors were inviting to this point under the direction of Misato. The apostle Scream steadily loses its balance and relaxes the power of the hand holding the convoy. It was not a convoy to miss that gap. Pull off the arm of the apostle Scream at a stretch, and visit an intense punch. But even the Tekken of the convoy will be taken in front of the A.T. field. "I do not know that it will not work! Comboi!" At that time, the red liquid energy overflowed from the right arm of the convoy, and its form changed to Energy Ax while it was watching. And the crimson ax is stepped straight down to the apostle scream. Although it seemed as if the blow was accepted by A. T. Field, Energy Ax would break into Melimeli in the A.T. field as it is, and it will tear apart. "That ... ... A. Neutralize the field ... No, I'm destroying!" Misato breathes whether this is the power that Eva and Transformers combined. "Star Scream ... Please leave this planet!" Energy Ax which passed through the A.T. field digests into the body of the apostle scream as it is, and tears the face of the star scream and the apostle into two. "Wow ... I am stupid ... This girl ... damn it !!" At the time Energy Ax reached the core of the crimson in the body of the apostle, Starcream ghost jumped out of the body of the apostle and faded into the empty space with a shout of grudge. The remaining Apostolic body fell down to the ground of the 3rd New Tokyo City without force, raising splash like fresh blood from the core. Misato looked stunned and looked at the figure of the convoy reflected on the monitor. Several hours after the battle ... There was a figure of the convoy who returned to the original size after finishing the battle at the Nerf military camp near the 3rd New Tokyo City. Beside that there is a trailer container of the convoy, and Nerv 's staff was undergoing renovation as a mobility maintenance facility of Convoy - Eva. There were also Lambor, helping with the staff with renovation, and Foiljack, who is interested in talking with Nerf's researcher. "Not just the starcream, but perhaps other Destrons will also aim for this earth again." The convoy murmures quietly looking over the sky. "And the monster called that apostle ... It may have been time for us and mankind to fight again and fight." There comes a vehicle mode bumble, and when you open the door Misato appears from inside. "Transformers ... ... it has become awful thing a bit ... ..."
Misato looked up with a gorgeous convoy · mode Eva appearing illuminated by the light in the dusk, with a mixed expression of anxiety and expectation. *note* The above is a Google Translation of the text story for the Transformers/Evangelion crossover. The original text can be found here. I felt it fit the Halloween season.